Skin Cooler, Portable Skin Care Products - High quality Taiwan Skin Cooler, Portable Skin Care Products provides by Jean-Modern's Ind. Co., Ltd. 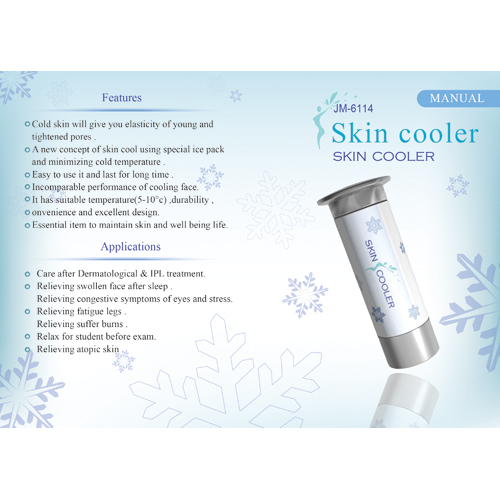 It is able to provide an immediate ‘cold therapy’ to irritated or tiring skin. Health-Relieve muscle injury and skin itching. Portable Skin Cooler. Care after Dermatological & IPL treatment. Relieving swollen face after sleep. Relieving congestive symptoms of eyes and stress. Relieving fatigue legs. Relieving suffer bums. Relieving atopic skin . Professional and Durable. Good Quality, Beautiful Appearance, Attractive design. OEM and ODM service provided.